Why did he not tell other devotees in Georgia that he was translating the books? How he hand-bound the books in his home. What is was like to be part of the first Russian devotee trip to India. How he found time to translate Caitanya Caritamrita when he had a full-time job as an oncologist. What inspired him to create his album The Red Dust of Ekachakra? How he wants to preach about Krishna consciousness through his music. What his definition is of success in Krishna consciousness. Get a copy of the album here. Krsnendu: Episode 20 of Successful Vaisnavas where we interview Nandapriya Prabhu, the devotee who translated Srila Prabhupada's books into the Georgian language while working full-time as a professional oncologist. He's also a wonderful musician who goes by the name of Zaza. He plays fantastic piano and has a wonderful voice. Nanda Priya Prabhu: Georgian language is actually one of the ancient languages in the world with a unique alphabet which is actually among the 14 unique alphabets in the world. And Georgian is not Indo-European. It's not Turkish. It's not Persian. it's not whatever it's quite unique that doesn't belong to any languages. It's exquisite. It has beautiful characters and lots of nice literature and poetry. It stands on its own. Krsnendu: Hare Krishna. This is Krsnendu Das. This is Episode 20 of Successful Vaisnavas and we are interviewing Nanda Priya Prabhu today. He's a devotee who translated Srila Prabhupada's books into the Georgian language, which is one of the Eastern Bloc countries, Georgia. And he did it while working full-time as an oncologist which is a highly specialized cancer doctor. So it's a really interesting story about how he came to Krishna Consciousness and how he was able to translate those books, even though he was so busy with a very important job. In addition to that, he's also a very talented musician. And he's just released an album and we'll be discussing a little bit about that album and about his music. He reminds me a little bit of Billy Joel in some of his songs. He's really great on the piano and he's got a kind of a unique little bit raspy voice which, yeah. It's got a wonderful charm to it. So you probably heard one of his tracks or a snippet from this track and the introduction and we might slip in a few extra samples as we go. So that's the interview that we've got today and in other news, it's been a little while since I did a podcast but we're back on the horse and I've realized that there's a bunch of content which I haven't released which would be of value to devotees so I'm thinking of releasing that shortly as podcast episodes. In that case we might release them more often than once a week. We'll just see how we manage but I thought instead of holding on to it, let me get it out there. Even if it's not on a strict weekly schedule or anyway, my schedule is not so strict as it is. So let me just get it out there and get the feedback from devotees and see what they think. It's different ideas about personal development, ideas about how we can improve our society in terms of empowering the devotees in our society as well as about how we can improve our preaching and reach more devotees and train devotees better and build up community and all kinds of things like that. So that's something to look forward to. I've discussed a lot of these topics in Facebook lives, and I've realized that some people prefer to listen to podcasts. I can certainly raise my hands for that, I'd rather listen to a podcast while I'm driving or running or something like that rather than have to watch something. So what I'll be doing is I'll be looking through those Facebook lives. And if I think it's something of value that devotees might like to, might learn something from I'll add it as a podcast episode as well. I've already put all of the Facebook lives that I've done up on YouTube and also put the audio on Soundcloud. So if you're listening to this on Soundcloud they are already there. If you are downloading this through iTunes or something similar to that then you can expect those episodes to be coming out shortly. All right. Yeah, what else has been news, a friend of mine a devotee here in Auckland Bhakti Marga Mataji has just written a book. She spent one year studying creative writing at University and as part of that assignment or that study she had to write a book, a novel, and when she wrote her book the assessor thought that the book was so fabulous that he told her that he'll publish it for her. So she's actually published this book that's called Ocean of Milk. And in her words she's trying to follow in the footsteps of Srila Vyasadeva and the Mahabharata in the sense of spinning a good story but teaching spiritual principles at the same time. So I've got my copy and I'm just waiting for the right opportunity to get into it and read it and find out what it's like. I've already heard some passages that Bhakti Marga was reading at her book launch and it was really fun. It was a bunch of books arguing with each other on the bookshelf. There was a bit of philosophy even in that. So that was kind of interesting. Oh to see what else we've got. happening here. I recently published an article, also did a Facebook live on it about how to attract Westerners as that's quite a big topic. You know, of course Krishna West is very famous for this. And around the world there are some different places which are really focused on this. It's like the Bhakti center in New York, The Loft in Auckland that are doing a great job. Not just in Auckland, we've also got the equivalent in Wellington. And I was just trying to think what are some of the factors that of course the end the discussion on a Facebook thread. One devotee brought up a point that in the old days there was a focus on book distribution rather than just getting donations from you know, Indian well wishers and because of that lack of focus in preaching it led to you know, bigger congregations, which is great. But it also led to less new people coming to the culture. And I think another factor as well is when that shift happened the focus moved to, moved away from preaching to young people who are the ones who are most likely to become Brahmacharis or brahmacharinis and fully take up the Krishna conscious lifestyle. Yes, it's just a few thoughts. I go into more detail in my article and the more I think about it the more I realize there's a lot more to say on it, but it was just a starting point and an area that I want to develop. Because of course once people join, once they get the books or once we start to preach to people, how do we cultivate those people? How do we help them to become serious devotees and how do we help them to stay in the movement and stay connected and stay inspired? So those are topics for another time. I would just like to once again appreciate Vaisesika Prabhu. He's, you know, inspiring book distribution all over the world and in particular just between you and me, he has got my wife, Nikunja, fired-up. She listens to him all the time and every chance she gets she wants to go ahead on book distribution. And just the other day. She went up the road to the shops by herself, distributed a few books,met some really nice people. And, you know, she's just really inspired and, you know, we owe it to Vaisesika Prabhu for that inspiration. We also would like to thank Bir Krishna Maharaja because he's also inspired the devotees here in Auckland to follow the monthly sankirtan Festival which Vaisesika Prabhu you know is promoting. Where each month, for one day in the month the devotees go out and distribute books, even if they have not done it before... Like the idea is that everybody gives it a go and so by Bir Krishna Maharaja's inspiration and by Vaisesika Prabhu's continued inspiring words, yeah, my wife is really excited about book distribution and there's also a lot of new book distributors here in Auckland, which is really cool as well. So that's just a really quick recap about kind of what's been going on with me. I'm excited about opening up the Empower and Preach membership again shortly. As I've mentioned a theme that I'm thinking about a lot at the moment is how we can increase the number of westerners in our movement and how to cultivate people who come to Krishna Consciousness in the most positive way, so that'll be like the theme that we'll be focusing on in the membership over the next period of time, as well as you know continuing with our, you know, providing the other resources there which help with japa and sadharna and fitting it into a busy life. So we're just trying to build up this membership with new content and new ideas. And as more members join, you know, we're getting to share with each other and that's where the value really comes is when we can support each other to become Krishna conscious and help others to become Krishna conscious. So with that said, let's go on to the interview with Nandapriya Prabhu or as he is known in the music world Zaza, and let's hear about how somewhere with a full-time job as a highly specialized doctor, an oncologist was able to translate all of Srila Prabhupada's books into his native Georgian language. Hare Krishna. Join us as we celebrate devotee's success stories preaching, business, community development, leadership, and personal growth all from the point of view of Krishna Consciousness. Our goal to help you make your life successful. Hare Krishna. Welcome back. This is Krsnendu Das for another episode of the successful Vaisnavas podcast. And today we have the privilege of interviewing Nandapriya Prabhu who is the devotee who actually translated Srila Prabhupada's books into the Georgian language. So he's a great pioneer in Krishna Consciousness in the Eastern European countries, and we've got him here today. So without further delay, let's meet Nandapriya Prabhu. Hare Krishna Prabhu, nice to meet you. Nanda Priya Prabhu: Hare Krishna. Nice to meet you and please accept my humble obeisance. Krsnendu: Please accept mine. Yeah, Prabhu, Can you just give us a little bit of...? Could you just give us a little background about who you are, and you know, what you've done in Krishna Consciousness. Nanda Priya Prabhu: Yeah. Thank you very much. Oh, that's why some to tell you something about myself. I'm originally from a country called Georgia. This is a former Soviet country. located between Caucassus Mountains and the Black Sea. It's a small country about five million population and it was part of Soviet Union before. I became interested in Krishna Consciousness, uh in about 1985. At that time it was still Soviet Union and as you probably heard Krishna consciousness was forbidden. I chanced actually to come in contact with some devotees and they gave me some books. It was actually Isopanisad and Easy Journey to Other Planets. I read them just like in a very short time and I was very much absorbed in all this all this points and things probably was talking and making I mean, I was very much convinced immediately, basically in what he said, especially I was very much interested in hearing for the first time in my life that the Supreme, he is a person, and he has names in pastimes, you can talk to him. You can be friend with him. You can even be a lover, whatever. I mean it can have a very deep personal relationship with the Supreme and his name is Krishna. So, it struck me very much from the beginning. Regular principles and some basic things. I was already familiar with I was following those principles as well based in my interest in yoga in general and Oriental philosophies in general. So it was not something new from me, but Krishna was really really new and all this beautiful descriptions for Krishna and uh, especially the holy name of course, I mean how by chanting holy name you can uh realize God and become devotee of God and even talk to him even in this life. I mean it was amazing for me. That was it was what I was looking for basically, um at the time I think I was 22 years old. I was uh, almost. graduated from the Medical Institute or school in Georgia, uh, the capital city called Tbilisi where I was born and raised and I started. So it was like well usually in the west you start quite late, but I was already when I was 17 I was actually admitted to the university and well, I had to decide what to do. Of course I didn't want to give up my profession. I wanted to go on with that. Uh, well, I became a devotee and I could speak English. At that time you have to know there were not so many people in Soviet Union whose could speak, uh, what we called foreign languages. I learned French at school. I was quite good at it. And actually since I was 18, maybe I had a private teacher in English and I learn English. You would not hear English or French or German or any other languages except your own language origin and Russian on TV, on radio anywhere else. It was the politics its Soviet time. I was basically speaking exceptional person in the way I could speak, I could read and speak and write in English. So the first thing devotees asked me to do was to translate books. I hesitated very very much because it's not easy. One thing you can speak English, but another thing is to translate from English to Georgian you have to be very good in style or and you have to have quite some experience which I didn't have. So I refused in the beginning. They were persuading me like anything because at that time books were like the, I mean the rare commodities let's say like that. There were a few Russian books that is all. We didn't even have English books available at the time. Maybe some devotees in Moscow and St. Petersburg had some English books, not in Georgia. So, I said no because I well I didn't feel like it because I didn't feel qualified enough. Then some couple of months later I somehow or other spoke with a good friend of mine, well good friend of my father who was an excellent translator from English to Georgian, even translating some old ancient religious books. Georgia is a Orthodox Christian country for centuries. So I asked him somehow to help me in English and he said "Why don't we take one of Prabhupada's books and translate it?" So I took it as a sign from Krishna and we started translating it. So the first book was the Easy Journey to Other Planets. Krsnendu: It's interesting. It's the first book that I read. Nanda Priya Prabhu: Yeah it's a great book. You know, when you translate to a new language. Prabhupada has so many unique expressions. First of all you have to get them together. For example, the Supreme Personality of Godhead. Nobody knows in any language what the expression is. It's a unique expression. Spirit soul or whatever disciplic succession, even spiritual master, and many other things. Three or three or four times a week going to him and we would go through English and Georgian version word by word, sentence by sentence, paragraph by paragraph. He will correct me, he will help me. It was incredibly good so actually he helped me very much. Nanda Priya Prabhu: No, no no. He was very devoted Christian. He was incredibly nice person, very intelligent, very well-educated. But very much devoted to Christianity. For him Christianity was the only thing, all the right thing basically. But he was of course cultured enough and intelligent enough not to say something bad about some other scriptures or something, but I mean for him, he wasn't didn't want to hear anything. He just wanted to help me. So he did the devotional service even unknowingly. Actually he did a great service to Prabhupada, to make Prabhupada's books available in Georgia. We made this book. We made Easy Journey to Other Planets done. Then you had to type it somehow. At that time it's...we're talking about '86 there was no computer in Georgia. I guess in offices somewhere, in a few places but there was no laptops. There were no personal computers. So, I had to get a mechanical typewriter. Georgian language is actually one of the ancient languages in the world, with unique alphabet, which is actually among the 14 unique alphabets in the world. And Georgian is not Indo-European. It's not Turkish. It's not Persian. It's quite unique that doesn't belong to any languages. It's Exquisite. It's beautiful characters and lots of nice literature and poetry. It stands on its own. Well, I got the typewriter with Georgian characters. So it made a lot of noise. I mean it was like it's really like a, lots of metal, the teleca heavy one. I had to get my room and I was typing like anything--. And it made lots of noise and I remember my grandmother, my mother would come and they would not say anything. I just made lots of noise everywhere. Yes. Yes, exactly and you are in trouble if you make a mistake because you have to I mean, it's not so easy to correct a little insert or whatever, you know. Well anyway, I was of course doing some drafts and there was not like a final version. So I was what you'll say I was um, I I typed this book and then we moved to Isopanisad. Then I really wanted to print those books and I was going from publishing house or printing houses. I would say from one to another and so on and so on. I did not tell this to any devotee in my country because I was afraid if we would be caught by KGB then devotees didn't have to lie. They just didn't know anything. What Nanda Priya? Is he printing anything? We never heard about it. And it would be genuine. So they would not be in trouble. I didn't tell anybody whatsoever. I was going every day to different places. Nobody wanted to print. Nobody want to have trouble. So finally I got somebody and he printed for me 300 copies. Then I had to manually, eh, what you call it bind those books. And it's, I was used to it. I was used to do like Russian Bhagavad gita's and all the books. Uh, we actually had some kind of handmade. Well some kind of um, a little fabric little factories, uh at home with knives and with glues and with all these things with leather and whatever leather or what. I mean to make the covers and hard copies whatever. So I knew how to do it, but I needed help. So I actually only told one devotee and we actually bind those books and we cutted them. Uh, and we actually gave to the devotees. It was probably '87 everybody was so happy. Then what I did Ishopanishad and I started doing bhagavad-gita. And it's about 88, 89 and then things are getting a little bit better in Soviet Union with perestroika and opening of the society and so on and I was chosen to go to India first time. Nanda Priya Prabhu: I mean we were tourist devotees. I think we were 50 of us. With Kirtiraja Prabhu and all this huge arrangements and with lots of devotees helping us and receiving us in India, and we went through different places Indradyumna Swami, Govinda Maharaja - at the time Ayodyapati Prabhu . Different devotees, they helped us so much. It was really incredible. Went to Delhi and Calcutta and Bombay and Jagannath Puri and Vrindavana and Mayapur. Then I came back in '89 and I was actually already working on Bhagavad-gita. Then at the time Vaidyanath Prabhu my good friend and now Bhakti Vijnana Goswami Maharaja, a very very nice devotee. He was so dedicated to BBT he actually did a lot for the Russian language. He was at the time residing in Korsnas. Although he is from Soviet. He is from Russia. He was actually residing there and he was coordinating the BBT work. He insisted that I should come to Korsnas, but I did not want to go. I think I thought it was too early because I still needed an editor for the Bhagavad-gita and how could I find him a Georgian editor in Sweden? I couldn't. So well, I was pushed so much. They said well, it doesn't matter, your grammar, your whatever, and your punctuation just maybe a good punctuation so much you can do. Yeah, of course I can but I mean we have to print those books. We have to produce those books. There is no time we have to do it. I was pushed by BBT in Moscow. So in the beginning of January 1990, I went to Korsnas which is Sweden and New Radha Kunda where there is beautiful Radha and, sorry, Gandarvika Giridhari deities. Bhaktisiddhanta Sarasvati's deities at his printing house...Was well so also Gandarvika Giridhari like, yeah like BBT deities. They are my deities, they are my everything so they actually I lived at their Lotus feet. And of course, I was not alone in Georgian language. First devotee I so-called converted to BBT was my wife, Narayani and she's from Georgia. When I met her in '86 or '87, I mean I saw the girl was very intelligent, University degree learning English... Good potential. I asked her to help me and she learned how to type and how to you know type all those things and whatever. So us two, then come Devamada who was a great person. Devamada, she did a lot of work, translation work together with me and editorial work as well. And then we got an actually wonderful editor, Arca-vigraha. So actually very suddenly we were four of us in Sweden at the Northern European BBT, which was an excellent place. I mean Harikesa Swami, my Guru Maharaja. He was so wonderful. He had this Printing House top level. I mean we had emails, we had... I'm talkin about 1990, emails, personal computers. It was just going on like anyting. Producing books, making books, translating books in all the Soviet languages and other languages of Europe too. So it was incredible and we did book after book. And Brahma-muhurta Prabhu who's in charge of North European BBT and has been in quite long long time. 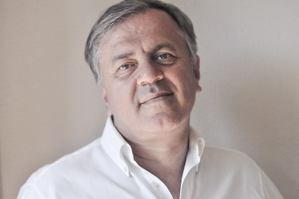 He especially liked Georgian language because of its beautiful characters and he was a great friend of us. And we made Bhagavad-gita, we made Isopanishad, Easy... Life comes to Clive, Perfect Questions Perfect Answer, Science of Self-realization. Bhagavatam Canto 3 and so on and so on. Eventually printed like 15 books, all together. So, in 1993, we had to, because of visa problems we had to go back to Russia and we continued our work in Lithuania and in Sochi, Russia. So in 1994, me and Narayani we married but we continued doing our work. I mean, at one point, I stopped BBT work in that actually we translated all 10 cantos. The only thing we did not translate was Caitanya Caritamrita because I had to you know, find some work and as a doctor and maintain my family whatever. So at one point, I took a little rest, a little break but in very soon I regained it. I started because what we did we'd translated all the books almost. But I wanted to have a new addition, new style. A good, I mean just polishing the style and making them even better. Krsnendu: Sorry, could you just repeat that last part because the internet is not good? Could you just repeat that last part? Nanda Priya Prabhu: Okay. About Arca-vigraha? Nanda Priya Prabhu: Yeah, well, Arca-vigraha, she began actually writing. She wrote many many nice books and she even got the best prize in literature in Georgia, and she is very well known and very renowned academic philologist and writer in Georgia. I was actually quite alone at the time. Well, my wife was there. But BBT work basically stopped for a couple of years then actually I got in very very good support from North European BBT or BBT in general and I got some money to finance and re-editing of our books. And because I had an excellent editor who made wonderful style for us. And well she did she did it quite cheaply I would say, quite cheaply. So she did actally I think four cantos or something like that, seven, eight, nine, and ten. Yes, then I wanted. Then later I thought okay. I think we should make all the books in the same style. And I personally paid to the editor who made Bhagavad-gita, Easy Journey, Isopanisad, Six Cantos of Bhagavatam Krishna book, well, the Letter of Devotion, Letter of Instruction, and I mean we made very homogeneous good text about all of Prabhupada's books. Well, what about Caitanya Caritamrita? At that time I was already living, in 2000, I moved to Denmark because I'm a medical doctor, I'm an oncologist and have a very good career here in Copenhagen, a top position in my medical field. Krsnendu: When did you move to Copenhagen? When did you start living there? Nanda Priya Prabhu: In the year 2000. Nanda Priya Prabhu: Yes. I actually decided to start translating Chaitanya Charitamrita. And I did. I did actually while commuting to my work. I had my laptop and I bought actually a 15 inches Mac, just in a screen big enough to make English PDF file. Okay Caitanya Caritamrita, one half of it and another, in another I had the word open so I could just translate like that. So every day I was working like at least one or two hours almost every day except the weekends, maybe. So, I think it took me seven or eight years to translate all of Caitanya Caritamrita. And then we began thinking about producing those books. And actually I spoke with with Northern European, we decided to start with ebooks. I mean everybody is into iPads and computers. Nobody buys it anymore hard copies or you know, so we actually made Easy Journey, Isopanisad,. We almost done with new Bhagavad-gita Prabhupada biography in one volume and lots of, all the other books are just standing in line. I have all the facilities to do that. I'm financing the whole thing alone. I have to do that. I have to say that not because it's a lot of money but still I'm doing it. I mean just just to show you how I understand these books. I mean for me this books are the well I shall say how how would you learn about Krishna if you don't read about from those books. I don't know. Of course there are some nice Gaudiya Vaisnava books and especially Bhaktivinode's books and Bhaktisiddhanta's, but for me Srila Prabhupada is like acarya of the acaryas. I'm sorry to say that but it's how I see it. And he just makes devotees like anything. I mean just reading couple of pages of his books, you can become a devotee I mean, his incredible power. And I thought I wanted to make those books available in Georgia, even though there is no much book distribution. I'm sorry, but still this is not something which can stop me. I wanted, I said to Prabhupada many times in my life I wanted to make his books done before I die. And well I only I'm actually turning 55 now. So I have translated all those books and I hope that I will be able to produce, see all those books produced in my language. And you know, these books are, these books are Krishna, and Prabhupada lives on in those books. That he was a basis. You can't, I mean it's important to have all those books in all languages. It doesn't matter if the people read or not. They may read, one day. I mean they will find their ways. They will change the world. I mean, I'm totally convinced about it. So I made those books. I'm so happy when I talk about those books when I do something about it. I can't wait. I'm torturing. I'm actually terrorizing my contact person, wonderful Hare Krishna Prabhu in northern European BBT, basically terrorizing him because I can't wait. I just always ask him "Well, where are my files? When do you convert them to ebook version or whatever. I want to proofread I want to..." You know, I mean, he's great. He's doing such a great job. He's helped, he's doing books in so many languages and I mean, I'm just joking. Krsnendu: Just like Prabhupada, he used to always say where is book? Where is book? Nanda Priya Prabhu: Whatever I do I learned from him and I learned from Harikesa Maharaja. I learned from this two people most I know in my life. And he, well I'm crazy about those books. Especially making them. I mean, it's just I don't know what shall I say? I do all kinds of things but this is my life. Nanda Priya Prabhu: These books are. Well, I just love it. I just love them. I just go crazy when I translate them you feel so much contact with Prabhupada, with Krishna, with Chaitanya Mahaprabhu. I don't know. It's something unique. You never feel like this. For me, it's at least, I don't feel Krishna so much except when I you know work on his texts. We will make those books. I'm sure about it and, you know, I just I just did this Prabhupada biography by such. It's wonderful book, it's just great book. In one volume... One day, I will make all six volumes, but I will translate them when I have time but one volume is fine to start with. But you know when you read about Prabhupada's life in India, I don't know what shall I say how he pushed the mission. For the ordinary people, he was just insane. Why was he doing all these things? Why was it doing all this. He was going to the printing house, he was pushing them. He was fainting on the streets on New Delhi in scorching heat. He was losing his consciousness sometimes, he didn't have any money, but he was doing all those things. And he went to 40 or something... So when I read all these things... To give him back and that's why I do the books. Because I feel so indebted to him and I feel so much love to him. So that's why I made so much, I mean I spent so much time to make those books. Even then when, I mean, nobody ever thought that there would be any devotee in Georgia. In Georgia, it's not a huge ISKCON movement in Georgia at the moment. It was at one point but not anymore. So somehow or other I did it and I have very good friends and devotees who actually appreciate this and they're waiting for those books. What shall I say I'm going, everyday I go to work. I see patients. I have a very responsible job and so many patients lives somehow or other you can say depend on you. Of course, I'm not in charge but you know, I have to do that either the treatment whatever I have. I mean, I'm totally engaged all the time. I have to earn money to keep on my living standard and support my family but books are always there. Krsnendu: So are you still doing translating in the trains? Not anymore? Nanda Priya Prabhu: Sorry, I spoke so much. No, I don't. I don't have to translate.. But there's lots of work to do. It' not enough to translate. You have to proofread, you have to do file to check, you have to read each book like four, five, six times before you are totally satisfied. Before you are totally satisfied...mistakes and you know, inconsistencies whatever. I do engage couple of top professionals who actually do the extremely good proofreading and even check the style and things like that. So I think books are on very very professional level. And as my part it's my duty is to make sure they are not deviating from Prabhupada's original books and his, you know whatever he says because editors can change the style because they may think that "Okay, it sounds better". But it may change the meanings. So nowadays where there's so much talk about, you know life changes in books or whatever. So, I feel quite responsible at whatever is conveyed in those books actually corresponds to what Prabhupada said.. So that's a lot of work to do. Krsnendu: Yeah, it's a big responsibility. Yeah? Nanda Priya Prabhu: Yeah, of course. Yes it is. In the other side, too. 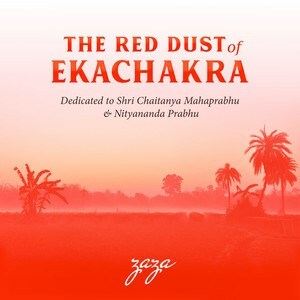 My music album called the Red Dust of Ekachakra. It's 12 Songs, actually 10, 2 songs that was just mixed, two played in two different ways. Some songs are in English and all music is made by me and it's like Jaya Radha Madhava, and Gaurangera-duti-pada, Jaya Radhe, Jaya Krishna, Jaya Vrindavan, Nityandanda Rama, and Nitai Pada Kamala, Sri Rupa Manjari Pada and whatever. Great bhajans, the great text which are rendered in my own way because I play piano and I sing. It's like you can call it pop or singasong style or whatever. It's coming very soon. It will be under my Karmi name, Zaza, it's called zazamusic.dk. It will be released very soon on iTunes. And Dina Bandhu has made great cover and great job to you know to make the website for me. I'm not so at it. And I have quite a few other songs as well coming. And I got quite some good responses from I would say really top Jazz musicians in Denmark. About 200 people, devotees some other people, musicians. And they all said that this was something very unique. So I had to produce those sounds..
Krsnendu: Yeah, I've heard some of the previous, Dina Bandu sent me some snippets of your album, it's really great. It's really easy music to listen to. Nanda Priya Prabhu: Yeah. Well, that's that's kind of my style. Krsnendu: Yeah, it's all about Lord Nityananda. What inspired you to pick that as your theme for the album? Nanda Priya Prabhu: Exactly I mean, you know whenever you think about Lord Nityananda and keep yourself... He blows your mind always I mean. I yeah, I mean I wanted to dedicate this album to Lord Chaitanya and Narottama das Thakur's songs I mean, oh my God, this is so.. He's smooth, he's so great. And it happened like this, and actually I had some songs before I became a devotee, some tunes. And I wanted to make more tunes and I'm not great at lyrics I should say. I can make music anytime but lyrics is just too bad. So and I actually one day in Radhashami I said well, at at he time I was at home it was Rajasthani day.. I had a day off or something and I was alone, I was working on Caitanya Caritamrita, I was translating at home. And then I said well, it's Rajasthani today. Let me write a song about you know on Jaya Radha Madhava. And I sat at my grand piano and I just wrote it like that. I think it's nice. Then another day I wrote about Sri-Rupa-Manjari-pada because I was translating about Rupa Goswami. I was translating about him and how he, when he was so old Gopala deity. Actually, he arranged to be brought from Govardhan Hill to Mathura because Rupa Goswami would never step on Govardhan Hill . So he was so old, he could not walk but Gopal came to Mathura and devotees brought him. I mean all this wonderful devotees, they brought him. He wanted so much to see the Gopal deity. And when I read this I said my God, I have to write a song about Sri Rupa Manjari Pada and I did. Then another occasion, I did something else and another so I actually picked up 18, sorry, sorry eight songs. Eight Vaisanava songs. So well, I hope you can like it, people will like it. Krsnendu: It's interesting how you got the inspiration at different times and it just collected over time. Krsnendu: Because I was wondering you know, like you've got a job, very important job and I was thinking how do you get the time to do these things? Nanda Priya Prabhu: I don't know. I have no idea. Well to make a, write a song for me takes maybe 10 minutes or something. So I cannot really say it takes a long time. And of course you have to go to the studio and cost money and well, I had I had a great, I went to a great guy who is a really good musician, a Pianist ,and he is classically educated pianist and I like this kind of styles. He made very easily very simple arrangements just conveying the moo d so nicely. I like it. And then just me and him, he's a Danish guy, we made this song. I asked my wife because she sings so beautifully to sing a backing vocal for me and she did a couple of songs I think. I want to release this album as it is... make it perfect all the time. I made another type of arrangement of music, but you know I said, well, let's do it as it is now and let's get it out. So maybe devotees will like it. So, let's see. Krsnendu: Yeah, great. Looking forward to hearing about how that goes. So what's your plan for promoting it? You said that will be on iTunes and otherwise you'll just be sharing it with your friends. Nanda Priya Prabhu: Yes. I have. We made a website, zazamusic, one word, dot dk. And then there is a Facebook website, a Facebook site as well. And, well, I don't know. I want to try like that start with that and I hope devotees will like it. It will be on iTunes and let's see. Maybe I could it could visit some, what shall I say some kind of do different trades and whatever. Nanda Priya Prabhu: It's not, I'm not dependent on income from the music so much I should say. Uh, it's uh..
Oh be alone. It's much more than that. It's hard. But um, I'm not economically dependent on income. And if people appreciate... One thing I can tell you, so many people whom I asked opinion from, listen to and they tell me often. "Oh, I really like this music Sri Rupa". "Oh, I like Nitai Pada Kamala". What about this Nityananda Rama, this is so good. I mean. They just listen, and I think I don't know. I don't know. I hope it will be appreciated by just ordinary so-called ordinary people too. Nanda Priya Prabhu: That's just my point. That's my idea. I mean devotees I don't, I cannot feel for our devotees. You know, I'm nothing. But, well, maybe some people can you know, learn about Krishna, learn about Nitananda Prabhu, Caitanya maha-Prabhu and so on and so forth, about Vindaav... yeah, that's my plan. Let's see what happens. Actually, as told you there is a one great jazz musician in Denmark. He even wanted me to go to studio with him and make some recordings, but he's very busy. But now I can send it to him, my album, and maybe he can come up with an idea. I would love to go actually, I... You know what I dream about? I dream about sitting somewhere with my piano in the middle of this walking street somewhere in the European, sitting somewhere and just singing my songs. Well not my songs, but I mean, I mean those beautiful bajhas in my way. And you know people stopping by and asking what is this? Nanda Priya Prabhu: Yes, innovate. Exactly. Yes. So, let's see. Let's see. Maybe that's a way. My way. Maybe. Maybe this is my way besides making books. Nanda Priya Prabhu: Because I can only make books for Georgian people. Non-Georgians cannot get that. You cannot get any benefit out of it. What about the others? I want to make music buddy. Krsnendu: Yeah, whatever you love about that is, you know, you've been giving some inspiration from Krishna and you've used that creativity and now you're thinking how can I use it to spread Krishna Consciousness? It's a wonderful combination. Nanda Priya Prabhu: Thank you. It sounds good. Yeah. Krsnendu: Yeah I've just started this podcast up again after about four years and I just had the idea now that because the project is called Successful Vaisnavas I thought of asking from now and each person I interview "What's your definition of success in Krishna consciousness?" Of course, you always will get those from Krishna. You'll always feel if you are doing the right thing, if it's the right thing to do. Somehow I think I don't have a goal to achieve, I have some small goals like in life like buying this and buying that and paying this and whatever. I think otherwise, I just actually enjoy the process of life in Krishna Consciousness in getting more and more in touch with Krishna. Then I think it's sweet that in every moment if and only it can become, it will and hopefully it will become sweeer and sweeter every time. So, I'm just grateful every day to whatever I get from Krishna and well somehow I think I take it easy and see what Krishna has prepared for me. And I have goals for example to make books and to make this and to make that, to help other people as well to become Krishna conscious. I just hope that it will be appreciated by Krishna and see what he will, which future he assess for me, has prepared for me. So, I think Krishna consciousness is a continuous process, it never stops. Start it, never stops. I mean you have to continue all the time and that's why it's like lifelong and eternal process. There is no end to it. And in that journey you have small goals or bigger goals and I like to achieve those but you know just go on, go on, go on all the time. Never stop. Some days are good, some days are bad, sometimes you get it together, sometimes you don't get it together. Whatever just go on. Don't make huge flames. Don't become a hero or whatever. Just be a normal person. Well, that's how I see it. Krsnendu: Yeah. Interesting. I think I was gonna ask you, but you seem to have answered the question in some ways. Like, you know, what advice do you have for someone who's practicing Krishna Consciousness, but maybe I can ask if you have anything to add in that sense. What advice would you give someone who's perhaps taking up Krishna Consciousness now or even they've been a devotee for a while and you want to give them some inspiration. What would you say? Nanda Priya Prabhu: Yeah, I would like to say one thing. I think Krishna Consciousness for those who are just starting or you know getting interest now. I think it's important to add Krishna and don't hurry to change your life very drastically. I mean stay whatever you are, go on with your life, but add Krishna to your life. You know what I mean? You know, some people just give up everything just like that because they are tired and just want to get released from all things. I think we have to give up our responsibilities, tend the family, get a job, whatever. I think it's important to do it gradually and very consciously just add Krishna to your life. But I was very much interested in yoga. Yoga would always tell me you have to go to the mountains. You have to leave society and I said "Oh, am I ready to look for that? Am I ready for that?" And I read Prabhupada and he said "You can be Krishna conscious anywhere. You don't have to change anything in your life." That I love so much and I think it's true. It's true. Forget it. Sometimes we're asking new people to stop whatever, give up things. No, I think they have to add and then whatever is not important for them, they will give it up. Nanda Priya Prabhu: ...magnet one point and there will be less conflict in their lives. I think devotee should also think about you know, it's one thing is you have to become Krishna conscious but so many of us have duties and responsibilities and we have to also think how am I gonna maintain myself, job, of course Krishna maintains us, but that's the thing that we have to think about our future, our profession, our whatever. It's things can be at one point so important that it can destroy us. If we don't have any foundation. Only very few people can be totally pronounced and dedicated only very few. Most of us are just ordinary people. We have to also have families. Not all of us, but most of us and we have to have something to get some, to do it in life, to have some income whatever. So add Krishna to whatever you and use your intelligence. That's the point. Krsnendu: Yeah, I think you're a great example that you maintain your position as a doctor and that's really benefited you because you've been able to support printing of the books and so many other things. Whereas if you would have given that up, it would have been much more difficult. Nanda Priya Prabhu: Exactly. I could not have paid for those books. I mean for the editors and for all this great professionals who helped me. Identify three I had to pay them. Yeah. So, yes. Krsnendu: Yeah. Thanks a lot. I could barely think of...might wrap up the conversation. I really appreciate hearing from you. So inspiring to hear about those times. There's actually just one question I did have in my mind that I just like to ask now. Can you just tell us what was it actually like in those early Soviet days because you mentioned that you're a little bit interested in yoga so somehow or other you were able to find out some information about that. But at the same time, you know, you've both got the, you know, the Soviet, you know, sort of atheistic pressure as well as the Orthodox Church. It must have been an interesting time. What was it like? Nanda Priya Prabhu: A very very special time. It was a very special time. I would say hard time. I'm sure there are lots of devotees who have lots of stories about it. I can do a podcast about that another episode. Krsnendu: Ok, let's do that on another episode. Because it'll be a change of topic. Nanda Priya Prabhu: I would love to I mean because it's a huge thing. But one thing I can tell you when I became a devotee, when I was talkin about God I was crying. You know how people were 18 and I said well, why don't people understand? Why don't they, you know, accept God and something like that? So many friends, so many people would just laugh at me, even be aggressive. Later in the '90s when I came back from Korsnas, from BBT when I came back to Georgia, when religion, I mean became a free thing, those people were wearing crosses a little, you know, everybody was baptized and things like that. Everybody I mean, religion was like a must almost. Yeah. So when I was, I mean believer or I understood God exists at least. So, everybody was negative totally. So it's a huge huge topic. I can talk about it for hours if you want. Krsnendu: Oh, yeah, that'd be great. Nanda Priya Prabhu: We can always, you can always get to that, no problem. I can tell you the stories which I experienced personally. Krsnendu: Yeah, that sounds really interesting because you've got the atheists, the communists side. And then you've also got this Orthodox Church, which has still got an influence at the same time. It's kind of a funny combination. Nanda Priya Prabhu: Everything. So, in a sense it's good but I think, yeah well, but it's just different. Krsnendu: Yeah. Well, that's definitely gonna be a great topic for another day. But thanks a lot, I'm glad to hear,y ou know, your story. It's a great example, as I was mentioning earlier about someone that's taken what Krishna's given and not unofficially given it up, but seeing how to use whatever you've got, you know, in Krishna's service. And whether it's your medical career or whether it's your, you know, ability to know English and do the translation, or efforts thru your musical talents, and you've used all of those things in a way that's been of great service to devotees and the movement. And, you know I'd just like to thank you for your time. And we look forward to hearing more about those adventures in those Soviet times. They're very interesting. Krsnendu: Thanks a lot.. Just reminded me of that, if they wanted to find, listen to your music, it's zazamusic.dk? I don't suppose to I could also get in touch with you... wanted to speak with you or contact you. Nanda Priya Prabhu: Thank you very much. Krsnendu: Okay. Hare Krishna Prabhu. Have a good day. Nice speaking with you. Hare Krishna. Nanda Priya Prabhu: Same, same. Thank you. Hare Krishna. Krsnendu: So there you have it, the interview with Nandapriya Prabhu, otherwise known as Zaza. Just a reminder if you want to check out his music and his new album The Red Dust of Ekachakra, you can go to zazamusic.dk. Thanks for listening! To find out more go to SuccessfulVaishnavas.com. We know that they have much more potential than they're presently using. Just associate with pure devotees then you shall be able to cross over the ocean of nescience.